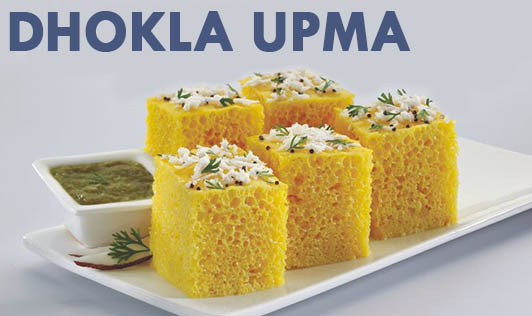 Dhokla is a popular non-fried Gujarati snack. However, it is no more confined to just the streets of Gujarat. Although it is available all across the country, making dhokla at home is usually difficult as the batter may not rise appropriately. So just in case you are expecting guests and the dhokla doesn't get to its right volume, you can try converting it into dhokla upma. Here is a quick recipe. 1. Combine all the ingredients for the dhokla together, except the fruit salt in a bowl and mix well adding buttermilk slowly as required (approximately ¾ glass) to make a batter of thick consistency. 2. Add the fruit salt to this mixture and mix well. Immediately pour this batter into a greased pan such that it is evenly layered out, and allow it to steam for 15 minutes. 3. Check if the steaming process is complete by inserting a knife edge. If the batter sticks to the knife, continue to steam until done. 4. Remove like a cake and cut into uniform small pieces. 5. In a pan heat oil. Add mustard seeds and allow them to splutter. Then add sesame seeds, green chilies, asafetida, onions, capsicum, tomato, curry leaves, and steamed corn in the same sequence. 6. Turn off the flame once the onion is golden brown and add the dhokla pieces to this mixture. 7. Mix carefully to avoid breaking the dhokla pieces. Garnish with coriander.